Ken worked in the timber industry in the South East of South Australia in the vicinity of Mt Gambier and later moved to Uraidla in the Mt Lofty Ranges near Adelaide were he worked in the market gardens supplying fresh fruit and vegetables to the Adelaide Market. Ken first commenced woodchopping at the age of 17 years at the Dartmoor Show (Victoria) in 1952. During that year he competed in various events throughout country South Australia and Victoria. The following year, he was called up for National Service and this curtailed his woodchopping career for a number of years. Ken has competed in woodchopping events in SA and interstate over the past 35 years and has enjoyed the mateship and competition. One of Ken’s finest achievements was winning the A.J. Wadham 325mm Tree-felling handicap event at the Royal Adelaide Show in 1980, this being the “blue Ribbon’ event for Tree-felling at the Royal Adelaide Show. He was the only South Australian to win this event. At the age of 70, Ken is still competing in open and veterans events and receives pleasure also from seeing his 2 sons compete. 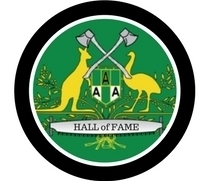 Ken has also contributed to the sport of woodchopping in South Australia by holding official positions with the South Australian Axemen’s Association and South Australian Axemen’s Council as President, Vice President and Handicapper. 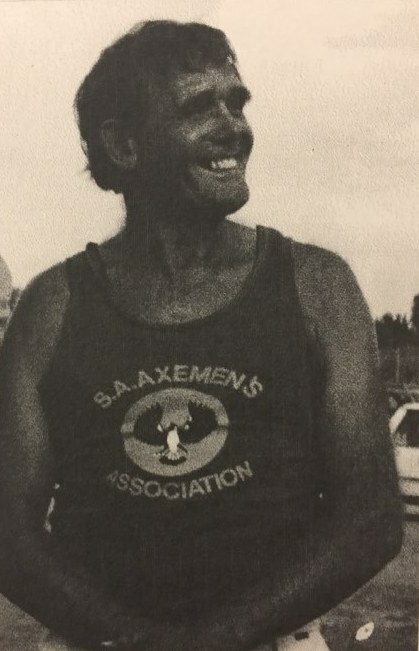 He is also a Life Member of the South Australian Axemen’s Association.